The VeloCityLight is designed to help make cycling safer. It is a powerful rear LED light that displays your speed to drivers. It makes you bright, distinct and visible on the road. As the cycle awareness of many car, lorry and bus drivers is not what it could be, the VeloCityLight prompts drivers to re-evaluate their own rate of travel with your displayed speed, helping them to make better decisions on the road. It also acts a brake light when you rapidly slow down or stop. The brain processes numbers differently than colours. A colour such as a red light remains an element in sensory memory, it is fleeting and passing. A number represents a meaningful symbol that needs to be processed and stored in semantic memory. The display of a number keeps you safer on the road by distinguishing the VeloCityLight from the noise of other red lights. We are a team of cyclists with many years of road experience riding in urban traffic and open roads, working for the software and prototype design company 1partCarbon Ltd.
As well as being keen cyclists and sports junkies, we include product, graphic, software and electronics designers. We started shipping our product on 22 July 2015. 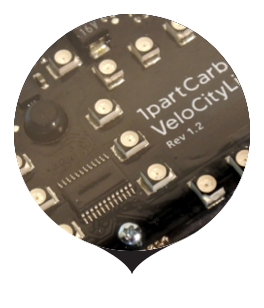 The VeloCityLight is owned, designed, made and marketed by 1partCarbon Ltd. It is trademarked and has a patent pending. 1partCarbon Ltd is a technology company registered in Scotland. Approx 66 grams - 110mm x 60mm x 20mm. The dimensions of an original iPhone yet a lot lighter, the VeloCityLight weighs around 66 grams and is easily detachable from the seat post bracket for security. Wheel Size: Just like a cycle computer the VeloCityLight can be set up to differing wheel sizes so it can be used from anything from a Penny Farthing to a Brompton and everything in between. Kph or Mph? Both! Just toggle to the one you need. The light has 4 adjustable levels of brightness to match the ambient light conditions and is waterproof sealed to keep out the elements. Paired to any Ant or Ant+ speed sensor the light displays the rate of travel of the cyclist in either Mph or Kph. If you don’t already have an ANT based speed sensor with your cycle computer, we offer the VeloCitySensor which works with our light as well as with ANT based cycle computers. As the bike decelerates, the light acts as a brake light, glowing brighter as you decelerate and showing the drivers behind that you are slowing down. Battery life: up to 14 hours of continual use. The unit is powered by USB rechargeable internal batteries with 1800mAh capacity. These offer between 6 to 14 hours of continuous use depending on the brightness level chosen. The unit comes with a micro USB lead so you can plug into your laptop or USB adaptor plug for charging. Worried about how much light you have? At any time you can check the remaining charge by pressing the left display button.